Do you have a keen eye for detail? See if you can locate enough hidden clues to solve the crimes and become a Master Detective. 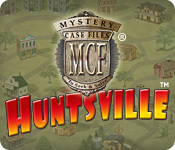 Mystery Case Files: Huntsville™ provides players with a collection of intriguing mysteries and brain-teasers to solve. There are picture puzzles to ponder, strange crime scenes to explore, and much, much, more! With thousands of hidden clues it's a new game each time you play Huntsville™! More than 20 unique locations. Thousands of items to find. Like Huntsville? Try all of the MCF games!! 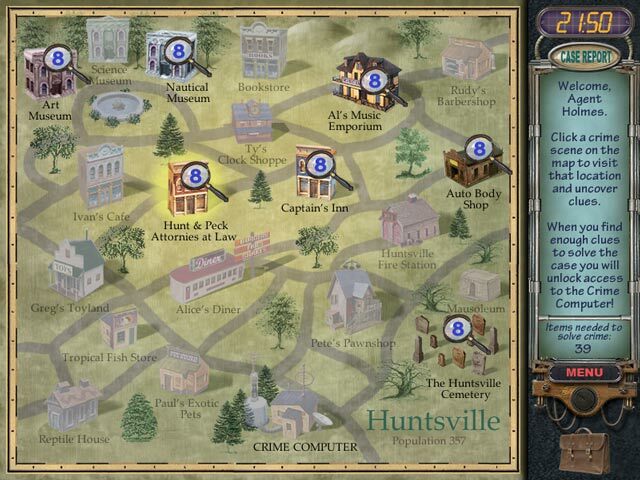 Mystery Case Files: Huntsville ™ is rated 3.6 out of 5 by 74. Rated 5 out of 5 by SYLPHEERA from Fantastic game! I heard about the Mystery Case File series and I had to try them. I also wanted to do them in order, since they have a longer story arc to the series, with returning characters. I love the old-world era graphic style, music and characters. This is great work! Huntsville is the first in the series and I'll be (gradually) doing all of them. Rated 5 out of 5 by MCF_Huntsville from The Start of a Legacy Before you read this, please note that I am not one of those people who put “I LOVE EVERYTHING ABOUT THIS!!! !” and five stars for everything on sites. Having been an MCF fan since 2008, however, my opinion should definitely be taken with a grain of salt. I've read the other reviews on this site, and I can tell that most of the bad reviews were from players who expected an adventure-style game like the later offerings in this series (this one is purely hidden object searches and simple puzzles) or who were aggravated by the short time limit. *If you feel like this might be you, don’t buy this game! * In any case, this was the second game of the series I played (my first was actually Mystery Case Files: Millionheir, which most people sadly don’t know about today), and to this day I love playing it. Sure, better games were down the road—this was made in 2005, after all, and this landmark of casual gaming was one of the first of its kind—but this one has several things going for it. This is a solid game: the scenes were always enjoyable, albeit occasionally maddening; the length seemed perfect; and, to top it all off, this had that special brand of creator Adrian Woods/Patrick Wylie humor that the more recent games have been sadly lacking in. It was funny, for crying out loud! For those who aren’t impressed by simple, witty, self-referential games, this is not for you. Plus, how many other games out there put your name on in-game content? I may just be geeking out at this point, but I think it’s pretty neat. While not my favorite, this one definitely ranks up there. I would recommend this for anyone who is being introduced to this genre as a whole (as I was when I started, way back when). That being said, I really don’t feel that this game is worth paying $10 over. I got it in a three-game bundle of the first three titles in the series for $5; if I were in your shoes, and I wanted to purchase these, I would probably head over to Amazon.com for a better deal. And finally: for those who are thinking about delving into the world of Mystery Case Files…prepare to have your mind blown, Master Detective! Rated 5 out of 5 by Ripcean from One Of The Best HOGs I must say that I disliked playing only HOGs since criminal case but big fish has made this awesome. I thoroughly enjoyed playing this even after so many years of its release. Rated 5 out of 5 by ClarenceLino from This is an mcf game that has been downloaded by many people I love it and it was very fun to read the stories this is also one of the oldest game from bigfish even it was old but it has many levels to play. Rated 5 out of 5 by Talidog from I love this game! This was the first Big Fish game I ever played. Who knew this one little game was going to open up years of game playing through Big Fish? This is a straight up HOG and it is fun and it is challenging enough without being too hard. I just finished playing it again for old times sake and I still love it. If you want a relaxing / fun game...this is it! Rated 5 out of 5 by mary117 from Fell In Love This is the first hidden object game that played on this site and I love it! I have played most of the titles but I just wish that more games were like this one instead of those long stories games. I just want to play the hidden object game! Rated 5 out of 5 by P8p4 from MCF Huntsville My name is preyansi .I like to play this mystery. Rated 5 out of 5 by splash1234 from Different! This game is so different from all the games they have out now with all the adventure. This one has all HOS and Picture Puzzles to help you see the culprit. Hilarious characters!! What a hoot! I had to laugh throughout the game. I was addicted and played my whole night off work. It is timed so there is some challenge there. Wish the graphics would have been clearer but then this game is older. Still, this game was fun AND funny :) I will play this one over and over as it says the suspects are different when you replay it. Sometimes an HO game is still fun when you don't want to think so much. The game was colorful and enjoyable. I wish they would come up with a new one like this but with the nice clear graphics they have these days. Rated 5 out of 5 by pennmom36 from MCF To Seek And Solve I love the Mystery Case Files series, so simple and so fun. You are a detective ( of course!) with the famous motto: To Seek And Solve. A murder has taken place and you have to search several locations such as the bookstore or firestation. Each location has several hidden object "clues" and you have to find all of the hidden objects in all of the locations within 20 minutes. After all of the items have been found you will need to solve a mini game, usually a puzzle of some kind to solve the mystery. This is a quality game that is fun from beginning to end, enjoy! 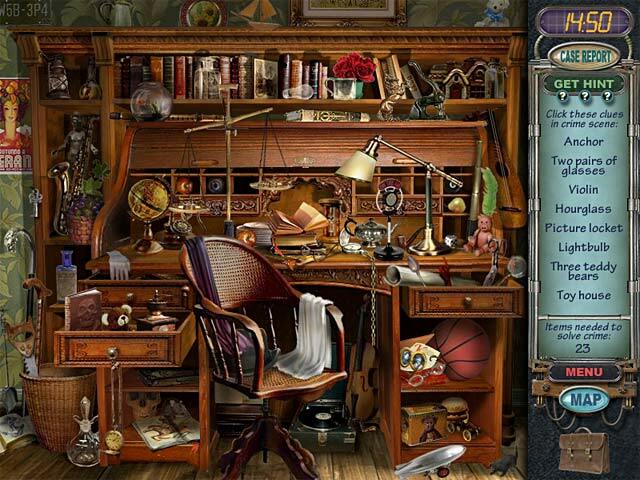 Rated 5 out of 5 by Shamsul_SZAA from Scary Sound Hidden Object Games Well, my #1 best hidden object games of all time. easiest MCF games to play. A crime spree baffles Huntsville™ police! Can you help solve the crime?